Image: Marvel Comics. Art by Mahmud Asrar and Jordie Bellaire. So far, Marvel’s Generations series has been thrusting together multiple iterations of its classic characters for some fun adventures. The latest issue, featuring Jane Foster and the Odinson, is much the same—but also offers an important lesson for each character that lays the groundwork for what’s to come for the God of Thunder. 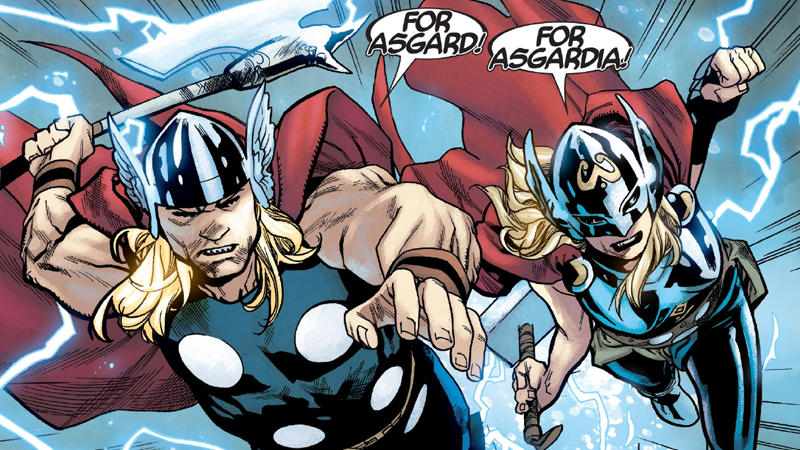 Written by Jason Aaron and with art by Mahmud Asrar and Jordie Bellaire, going into it many fans expected Generations: The Unworthy Thor/The Mighty Thor to lay downsome insight for what will become of Jane Foster’s version of Thor now that the ‘Unworthy Thor’—the Odinson who lost the ability to wield Mjolnir a few years ago, and has since decided to strike out on his own path beyond the realm of his former fellow gods—is back on the scene. But the Odinson we meet in Generations is not the Unworthy Thor we currently know... it’s a very young version of him, from the time before he ever became the God of Thunder and wielded the legendary hammer. Like the Odinson we all know and love, his younger self is just as brash and rebellious as you’d expect—on uneven terms with his father Odin, and stiffled by the stuffy order of Asgard. He’s still desperately trying to command the worth required for him to claim Mjolnir as his own, but is learning the hard way that being a boisterous hero who’s willing to fly down to Midgard the minute he hears a prayer in his name isn’t all there is to worthiness. But, being headstrong and stubborn as he is, that’s exactly what Odinson keeps doing. This leads to him riding down to help a band of vikings who, bizarrely, have found themselves in Ancient Egypt, fighting the forces of Apocalypse himself. That’s where, out of nowhere, Jane Foster finds herself plucked out of an adventure with her fellow Avengers and dumped alongside a version of the Odinson she isn’t familiar with. At first, they don’t get on too well, but quickly enough the two figure out that they have more in common—mainly, a bullish love for punching things in the face, whether it’s with a lightning hammer or a lightning battleaxe. It makes sense that it’s only in the whirl of combat that the two Thors come to really understand each other—after all, it’s where both heroes feel like they truly belong, away from the mess of the politics of the nine realms and on the front lines. But that’s especially a problem for Jane, who is struggling to deal with a world where when she’s not fighting as the Mighty Thor, she’s simply a human woman being ravaged by the cancer slowly but surely eating away at her body. Why, she contemplates, should she ever turn back? Why shouldn’t she just keep being Thor and leave Jane Foster behind? While the Odinson sees in Jane a future for his attempts to become worthy, what Jane learns from the younger Thor is that the God of Thunder is much more than being able to wield Mjolnir. Despite Thor’s power coming from the realm of Asgard, what truly makes a Thor—whether’s the Odinson or Jane—is their humanity. The young Odinson draws his strength from the people around him, the people who pray to him and rally him to go flying into battle, using their faith to bolster his own strength and let him do the impossible things a god does on a daily basis. Jane’s struggles might be more personal than the Odinson’s, but the strength her frail human body has left, fighting cancer, is what keeps her rooted to Earth. If she lets that slip away altogether to forever remain a Goddess, she loses a big part of what makes Thor, well, Thor—the dichotomy of being a god torn between two realms, Asgard, and Midgard and representing the best of both of them. When the battle against Apocalypse is ultimately won (and hilariously, the Viking raiders flee Egypt with the nose of the famous Sphinx as their trophy), that’s pretty much what Jane tells the young Thor before she departs back to her own time—at the moment, he’s struggling to lift Mjolnir and become worthy because he still sees it as a divine legacy, passed down from Odin to Odinson. But what will ultimately make him worthy, to become the man that would eventually inspire Jane herself to take the hammer, is the bonds he forges on Midgard and his connection to humanity. If Jane is going to keep being the Mighty Thor,she realises that that’s something she can’t let go of either, even if it means that it could kill her. And given that the first storyline of Mighty Thor’s reboot in Marvel Legacy is called “The Death of Mighty Thor”, then that consequence may raise its ugly head soon enough.